One of the all time classic bottlings of the Scotch whisky world! Previously the most northerly mainland distillery in Scotland, it was recently superseded by Wolfsburn. This is a cracking dram, and a perfect example of the north highland style: replete with oily, maritime notes, and spicy fruits. This whisky has spent 12 years in mostly former Bourbon American oak barrels, with a little Sherry in the mix to give it a tremendous balance and depth of flavour. The nose brings zingy citrus peel and maritime notes of oil and salt. The palate brings a delightful richness, with buttery notes and a little spice and smoke. Overripe bananas round off the palate. The finish is lingering with Bourbony notes of caramel and cherrywood. This whisky picked up a Gold in the 2013 San Francisco World Spirits Competition, and also won the highest prize in the World Whisky Awards of 2010. 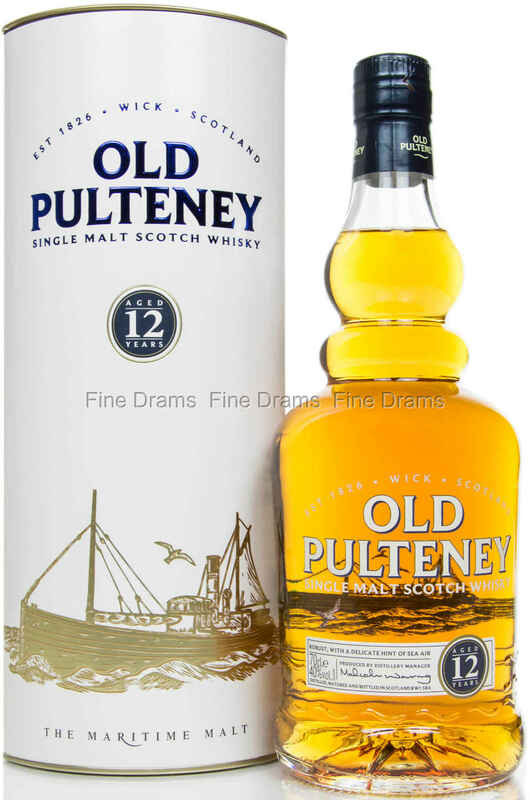 The slightly strange bump in the neck of the bottle reflects the interesting design of Old Pulteney’s pot-stills.